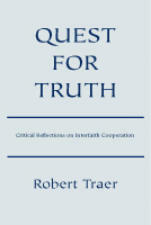 Title: Quest for Truth: Critical Reflections on Interfaith Cooperation Author: Robert Traer A PenMark Press Book soft cover 236 pp. USD 20.00 ISBN 978-1888570526 1999 The Davies Group, Publishers "[…] to call for interfaith understanding and cooperation is to aspire for personal interaction between members of different religious traditions in a way that enriches their faith. We organize interfaith dialogue not to challenge the faith claims of others, nor simply to learn about them, but to deepen our faith within our own religious traditions by addressing issues of truth together." (from the author's preface). There are choices to be made in clarifying the goals of interfaith cooperation, the language used in dialogue, and the strategies undertaken. Quest for Truth defines limits to interfaith cooperation, suggests ways of guarding against religious propaganda, illustrates how dialogue about ethical choices can affirm mutual respect and reject relativism, offers a critique of the global ethic that encourages dialogue among communities of faith, and in distinguishing faith from belief, clarifies how the quest for truth might be pursued through interfaith dialogue. Description of contents In Part One (the author) argues that interfaith cooperation should be understood as a quest for truth involving repentance, forgiveness and hope. Without such a commitment, interfaith programs may merely provide a platform for religious propaganda. Part Two presents a number of reflections on the language used in interfaith programs. In the author's experience, how we talk about one another is as important as how we act toward one another. Our language shapes the way we see the world and those with religious traditions that differ from our own. Therefore, it affects the way we understand what we hear and how we interpret the beliefs and the religious disciplines of other faith communities. Part Three concerns international initiatives. Part Four concludes with five essays concerning the way we talk about religion and religions. Reviews “With urgency, humility, and great acuity, Robert Traer here shows us what we need to do to establish new goals, language, initiatives, and approaches to interfaith cooperation.” — John Buehrens, President, Unitarian Universalist Association “Reverend Dr. Robert Traer probes with great clarity the major issues of multi-religious cooperation as humanity prepares to move into the next millennium. Throughout his remarkable book, one is struck by the author’s deep intelligence and creativity. In Dr. Traer’s view, the required creativity among the religious traditions must respond to the major problems that face the human family as well as the inescapable pluralism of religion itself.” — Dr. William F. Vendley, Secretary General, World Conference on Religion and Peace “Religions grapple with profound questions of human life such as the possibility of repentance and forgiveness, of peace and justice, and above all, of truth…Robert Traer brings a critical and questioning mind to bear on key concerns of interfaith dialogue and challenges. This is an important and salutary book which all engaged in interfaith dialogue should read, and which should help to convince critics that interfaith dialogue has a vital contribution to make to human welfare and to a fuller understanding of Truth.” — Reverend Marcus Braybrooke, Co-President, World Congress of Faiths “…In these pages you will be provoked, prodded, and propelled beyond the ‘interfaith bazaar’ and ‘religion as resource’ approaches to a more honest, critical, and in the end, hopefully more productive engagement in interfaith cooperation—one that respects the integrity of diverse religions as the ground and source for ethical action at both local and global levels.” — Dr. Patricia M. Mische, President, Global Education Associates Author Dr. Robert Traer (PhD, Graduate Theological Union, Berkeley; DMn, University of Chicago Divinity School) served as executive director of the International Association for Religious Freedom from 1990-2000 and represented the work of the IARF on religious freedom at the United Nations. (The IARF is an interfaith organization involving Buddhists, Christians, Hindus, Jews, Muslims, Sikhs, Shinto priests, members of indigenous traditions, Unitarians and Universalists.) In 2002 Dr. Traer was a Resident Scholar at the Tantur Ecumenical Institute for Theological Studies in Israel, and in the spring of 2005 he served with the World Council of Churches’ Ecumenical Accompaniment Program in Palestine and Israel. He is a retired minister in the Presbyterian Church (USA). Dr. Traer has taught courses on ethics and religion at the Dominican University of California in San Rafael. He is the author of Doing Environmental Ethics, Faith in Human Rights, Quest for Truth: Critical Reflections on Interfaith Cooperation, and Jerusalem Journal: Finding Hope. Many of his writings are available online.